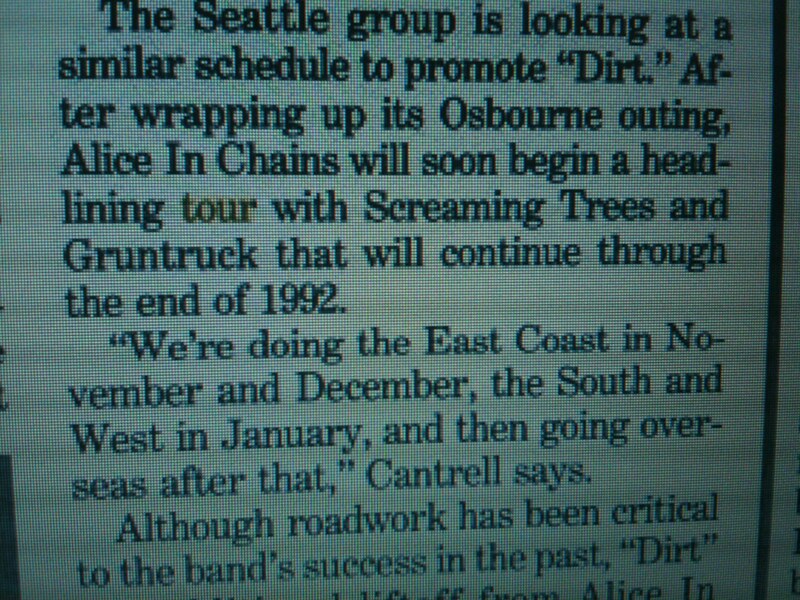 If you are a longtime fan of the rock band Alice in Chains and have followed their music since they blasted the Billboard Charts in 1990, you will most likely remember the tour dates I’m referring to in this essay – because Layne Staley was fronting the band on crutches, and had badly broken foot. This story begins in sunny Tampa, Florida during the late 80’s when I was busy trying to be a Mudhoney fan, and spent a good deal of my time promoting just about any artist on the Sub Pop record label. Alice in Chains signed with Columbia in 1989, but they were so good, I had to take note when their album showed up in my bin. I had a gig at a community radio station that granted me access to occasional concert tickets and lots of new releases. After a year of entering pledge-drive information into the station’s DOS database, I finally worked my way up to the position of Music Screener and eventually ended up on the air. When tickets came my way for Alice in Chains, LIVE at Jannus Landing in St Petersburg, FL – Monday, November 16, 1992, I had succumbed to their incredible talent, and was very excited to see them. (I will talk about this event and venue in the past tense – however, I know that Jannus Landing is alive, and still kicking out the jams on a regular basis). The venue was (and still is) an actual outdoor courtyard in downtown St Pete. There was a nightclub entrance attached to the outdoor stage where Alice in Chains would be performing with The Screaming Trees and Gruntruck. My friend Karen and I met up at about 7pm the night of the show and drove to the venue. After finding a place to park, we set off on foot towards the entrance of the courtyard/concert area. As we passed by the nightclub, I informed Karen that I needed to use the restroom. We stopped in front of the window to the club and tried to look inside. With our hands cupped around our eyes we could vaguely make out the shapes of people moving around, but it did not appear the club was open or crowded. As we peered in, the door swung open, and a concert promoter from the community radio station asked if I needed something. “I kind of have to pee,” I said, doing a little pee-prance. Maybe he recognized me from the radio station, or perhaps he thought I was someone else, regardless, he held the door open and motioned towards the restroom and let us in. Karen and I hurried towards the facilities, and then walked to the bar to see what was going on, and ask if we could get a drink. Others were lounging around and the bartender appeared to be busy serving cocktails, so we sat down next to some rock n’ rollers dressed in leather and waited. It was quiet inside the club, and we could hear the beginning notes of the sound check wafting from the stage. “That’s Layne Staley,” she finally whispered. And it was. Layne Staley was indeed, pressed against my left arm. Karen, who was now almost fainting, managed to wander away in a fit of star struck oxygen deprived delusion, and stagger down the hallway where she took a seat near the door. “Um, my friend, Karen (I motioned with my head, in her direction) was wondering if you could sign this napkin.” It was the least I could do for her, as I did not know CPR. Layne looked at me, for what seemed like a long time, and then said, “I like your lipstick”. I informed him that I had an entire tube in my pocket, and asked if he would like to put some on. “I’m feeling a bit (he paused) piqued.” Layne tapped his fingers to his face as if to say, see how piqued I am? He then motioned downward and gestured towards his broken foot. I removed the lipstick from my front pocket, Revlon’s Toast of New York, and handed it to Layne Staley. He slid the top off, and dabbed the makeup onto his upper and lower lips, making several passes, and then rubbed his lips together. Clearly, he had done this before. “How does it look?” he said, handing the tube back to me. I told him it looked great (and, it did), and mentioned that he could keep the lipstick. “Keep it, keep it. It’s yours, keep it.” I muttered. He signed the napkin, looked up, and smiled at me. I quietly thanked him and promptly assisted Karen out of the building. In 2002 when Layne Staley died, my mom called me and said, “I hope they don’t find your DNA on that lipstick.” I was very sad, but impressed that she remembered the details of my story. The death of Layne Staley was a tragedy; he was a talented man, who applied, and went on to perform in – my lipstick. I can’t say that about anyone else. John Lennon was shot. Upstairs apartment bathroom, doing my hair and listening to the radio. Stevie Ray Vaughan died. Pulling into a parking space at an auto repair place to deliver equipment for my job. Kurt Cobain was gone (he died on April 5th, 1994, the same day Layne Staley died in 2002). At a traffic light on Rt 72 waiting to turn right, on my way home from the store. Layne Staley had passed away. Getting ready for work in my bedroom. This essay is too long, unlike the lives of so many talented artists who left us too soon. thanks.. that was definitely worth reading. We miss Layne so much. On our way to Miami to see Alice in three days. I gave Jerry a note when we saw them in Oklahoma. Just thanked him for choosing to live. Thank you, Michelle! You are a dedicated fan, thanks for reading and for commenting. What a wonderful heartwarming story. Thank you for sharing this with those who loved Layne and AIC. Currently I myself am tryin very hard to recapture that LOVE with a new bio to honor Layne, Mike, and Alice in chains. It is done with Love- it is my sort of love letter to Alice in chains like Cameron Crowe did in the movie “singles” and I hate to say I have taken a lot of heat for wanting to pursue it. My feeling is this on that subject. Layne, Jerry, Sean, Mike I and Mike Starr need to be represented with HONOR and RESPECT and above all LOVE and I am damn serious about that. And WE, their FANS need it as much as they do. I will dedicate my book to the FANS- as I too am one and believe that we are critical to making it a beautiful story for the guys to read. Please support this effort, I welcome comments, suggestions, and encouragement and can be reached at 4Alice4ever@gmail.com. I have alot put together a personal tribute to Layne, Kurt, and Andy consisting of 140 videos along with my personal commentary, it is also posted on my FB page, I hope you guys and gals with check it out- its my platinum album!!! hahaha!! I am damn proud of it as I honored them well. 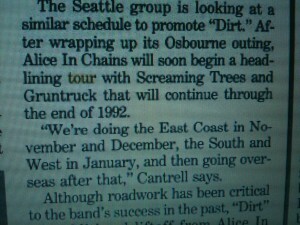 Thank you for your support and long live the Great Alice in Chains! I was at that show in St. Pete at Jannus Landing. Layne was using a wheel chair I believe. My friend and I were right in front of Mike Starr. He gave me a beer and a guitar pick. I still have the concert shirt that has the xray of Layne’s broken foot. It’s one of the best shows I’ve been to. Quick question. What route 72 were you on when Kurt passed? I’m from Jersey and lived right of route 72. Great piece I enjoyed reading it. Tom, thank you for the comment and for the kind words. I was on RT 72 in Connecticut, not too far from NJ but a different RT 72 for sure. Jannus Landing still gets some great shows, and I hear they are doing something new/different with the Club Detroit space that connects to the concert venue. ROCK ON, Tom!